Recently I read a post on social media where someone was asking what to do with a handful of ingredients they had on hand. Chicken, tomatoes, and zucchini were some of those ingredients. Cook them all together I said!! In the summer, these three ingredients together are some of my favorite. To be able to toss everything into one pot on the stove (or you could do this in the slow cooker) is one of my favorite ways to cook. 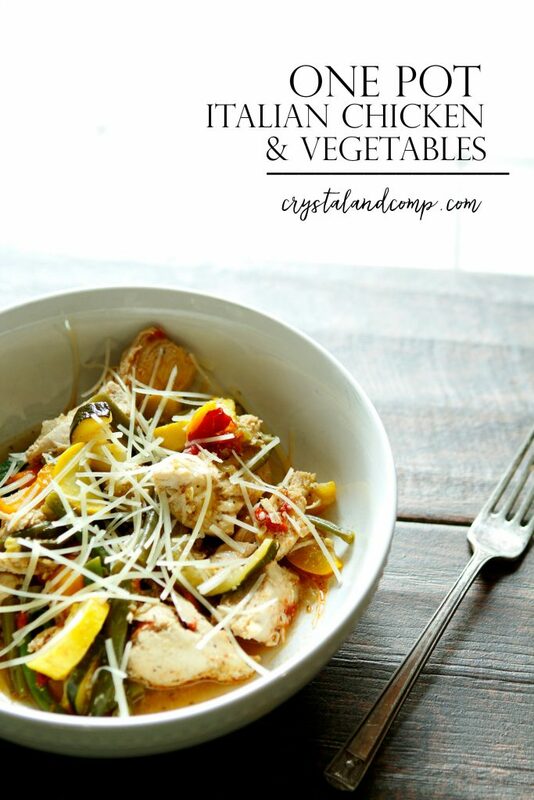 Let me show you how easy it is to make this one pot Italian chicken and vegetable meal. Your family will love it. Check out all of our easy recipes for busy families while you’re here! Grab a large cooking pot, I love my cast iron dutch oven. Add the olive oil, onion, and garlic. Simmer over medium heat. After about 3 minutes add the chicken breasts and place them over the cooking onions and garlic. Cook them for about 8 minutes on each side or until the juices run clear. We grabbed our Forester Farmer’s Market chicken breasts from Sam’s Club. This pack has a total of 8 very large chicken breasts. This is butcher shop quality chicken that is Non-GE and Non-GMO. Literally a family farm in Arkansas. As they say, “Chicken that is chicken.”. Most chickens today just aren’t what they were in Forester, Arkansas back in the 1930’s in the hills of western Arkansas where the company founder grew up during the Great Depression. It was a time when you grew your food. I remember my grandmother would share stories like this with me when she was still alive. She was born in 1916 (in Arkansas as well) and they raised chickens in their backyard for this very purpose. Want to know where you can find Forester Farmer’s Market chicken? 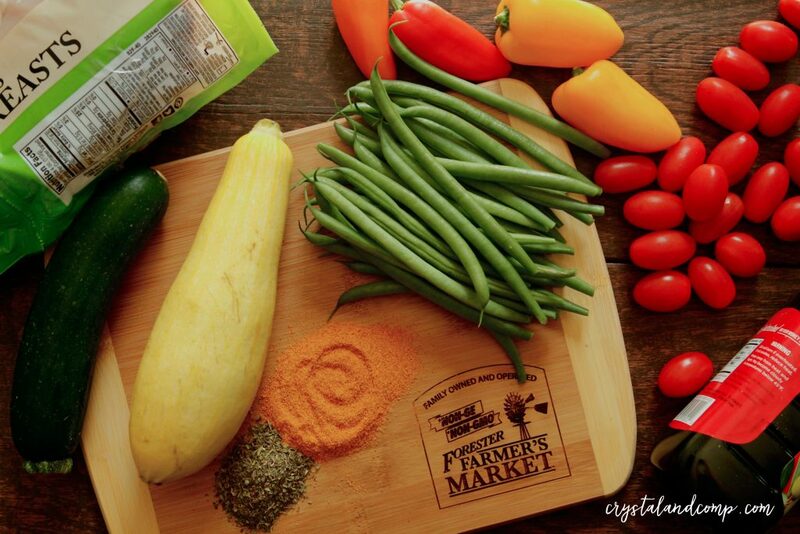 Head here to find a location near you that sells Forester Farmer’s Market ! Once the juices run clear in the chicken, take each breast out and cut into cubes. toss in the remaining vegetales. Toss back into the pot. Toss in the remaining vegetables. Evenly sprinkle all ingredients int he pot with the seasoning salt and Italian seasoning. Stir and cook over medium heat until the vegetables are tender. I popped the lid on for about 15 minutes. Plate it up (or use a bowl like we did) and top each plate with Parmesan cheese. This is literally amazing! The chicken melts in your mouth. All of the flavors of the vegetables are just amazing and blend together so well. You can serve it with a salad if you want, but honestly, this was enough. You know what else I bet would be good? Some steamed brown rice underneath. Dinner was done in 30 minutes or so. I am going to be on the look out for more chicken from Forester Farmer’s Market. The quality did not disappoint and I love how big each breast is. They have whole fryers too. Those can cook in 30 minutes in the pressure cooker. What is your favorite way to cook chicken on a busy night? That looks so good and flavourful too. I can’t wait to try this chicken dish. We have so much chicken here – we just had it last night too. Chicken is so versatile. It’s my favourite affordable meat. I love meals that are one pan, because they make my life a lot easier. Even better when they include one of our favorites, chicken! 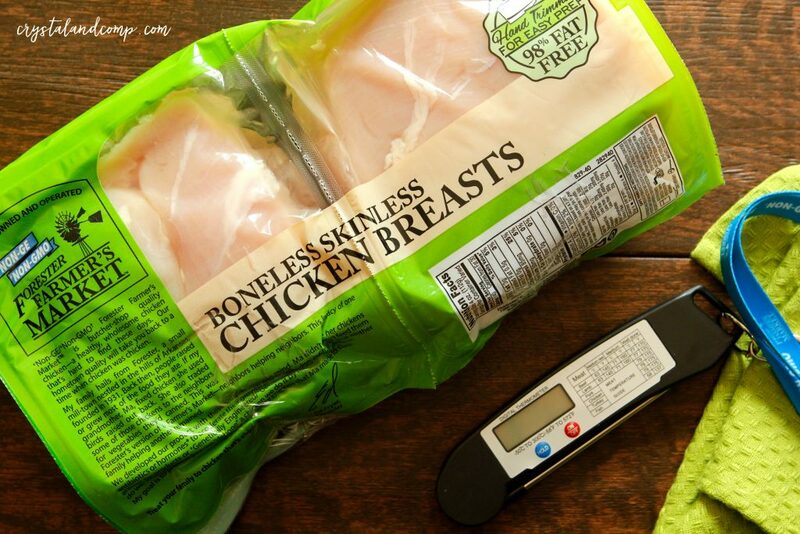 I don’t think I’ve seen this brand of chicken locally in our stores (I’ll have to look), but I love buying boneless skinless chicken breasts, because they are quicker to cook. Great recipe, btw, I love the fresh produce you used. First of all, gorgeous photos! Secondly, this sounds like a delicious and easy enough dish. I really like the Forester’s brand of chicken so that’s an awesome bonus for this recipe. Pinning to add to my meal calendar! Aw thank you! And yes, super easy! With school started soon I am looking for new recipes that are easy and kid friendly. This one is perfect. So easy and yummy! And ONE POT! Love those kinds of recipes. Thanks for the great idea. Posts like these make me realize that I haven’t yet picked up an Instant Pot yet. They are absolutely brilliant. And I totally love the recipe you have here – this is our type of dinner! Yes! Instant Pots are amazing! This could certainly be recreated in the IP! I like chicken any way that I can get it! It is one of the most versatile meats. It definitely pairs well with these veggies. I would like the try the recipe. I am always looking for good fall recipes! 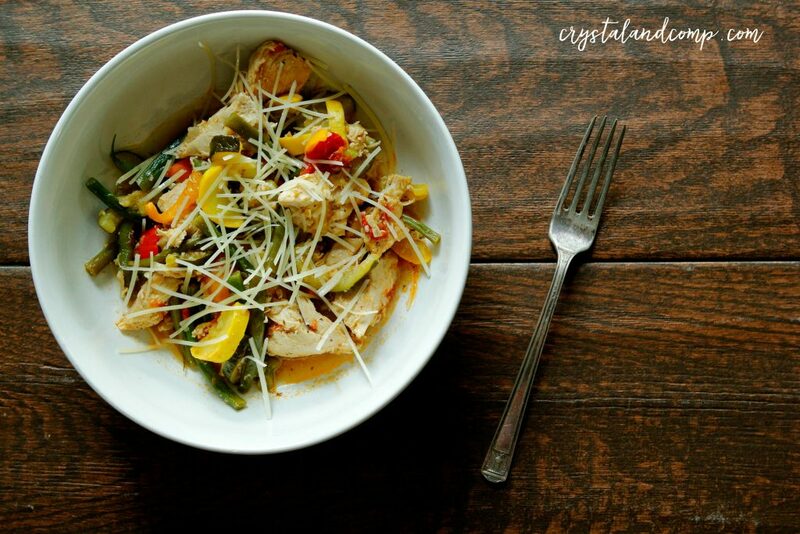 This italian chicken and veggies dish looks like it would fit that bill. Although, as chilly as it’s been here lately, would probably fit the bill now lol! Thank you for sharing! Yum! I love dishes with tons of veggies. I have had tons of squash from my neighbors’ gardens this year, so this is actually perfect! Italian night at my house! 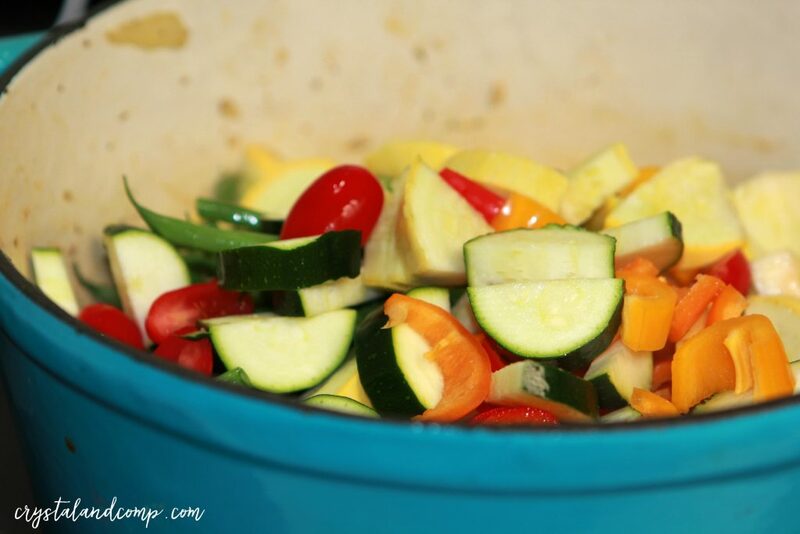 One pan meals are my favorite, especially using veggies I have on hand from our summer garden. I’ve seen the Forester Farmer’s Market chicken at our local Braums Ice Cream, but I haven’t tried it yet. I wish it was available in a local grocery store instead as I don’t get to Braums as often as I like. Thank you for sharing the recipe I can’t wait to try it.